Coming off his roughest outing of the season, Eduardo Rodriguez began going over his game plan a day early in an effort to change things up. Considering how quickly he came out of the blocks Wednesday evening, the new approach paid dividends. The Orioles' No. 3 prospect took a perfect game into the fourth inning and a no-hitter into the sixth as the Class A Advanced Frederick Keys shut down the visiting Myrtle Beach Pelicans, 3-1. "I was focused before the game," Rodriguez said through teammate Marcel Prado, who served as translator. "The last outing I had was pretty bad and I was thinking about it. I got focused the day before the game and as soon as I got to the ballpark I was thinking about the hitters and the way I would put them away." Five days after yielding seven runs on six hits and five walks over four innings in a loss to Carolina, Rodriguez (2-2) retired the first 10 batters before Luis Sardinas reached on shortstop Sammie Starr's throwing error. Designated hitter Trever Adams reached on a miscue by third baseman Travis Adair leading off the fifth, but Rodriguez set down the next six Pelicans to carry his no-hit bid into the seventh. The 20-year-old native of Venezuela threw 60 pitches -- only 14 out of the strike zone -- through six innings, but Myrtle Beach chipped away for a run on three singles. Sardinas legged out an infield single to start the seventh, Rougned Odor followed with a base hit to right field and Preston Wedd plated a run with another single to right. Rodriguez retired the final two batters before turning things over to the bullpen in the eighth. He ended up throwing 63 of 85 pitches for strikes. "This was the best outing of my career," Rodriguez said. "I felt good today, awesome. I was throwing inside with my fastball and then on the outside corner, and I was working ahead. "This was the first time I was close to throwing a no-hitter. I didn't care about the infield hit, I was just trying to focus on the next hitter. The other hits were on good pitches, but I give credit to the hitters and the way they hit the ball. I was just upset I could not come go back out for the eighth. 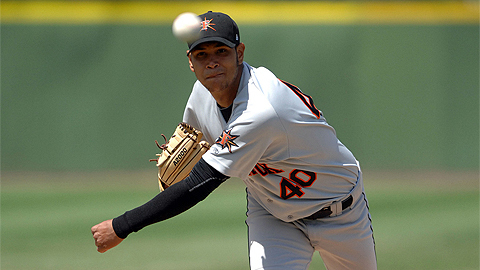 Signed by the Orioles as a non-drafted free agent in 2010, Rodriguez is a month into his fourth year of pro ball. In 2012, his first full season, he went 5-7 with a 3.70 ERA in 22 starts with Class A Delmarva. Trent Howard followed with innings of scoreless relief to earn his first professional save and lower his ERA to 0.66. Pelicans starter Alec Asher (2-2) allowed three runs -- two earned -- on three hits and three walks while striking out five batters over six innings.